At the NOAH Berlin conference we launched the new Unified Corporate Innovation Platform. Based on our successful startup application and innovation scouting platform DealMatrix now support any type of innovation you want to keep track of and evaluate. Startups can continue to apply using the questionnaire, but you can add companies, internal innovation projects or ideas yourself via your the platform, via CSV upload or from third party databases. Send interested startups to your customizable questionnaire to request information about their company profile and get the most up-to-date data. Invite startups via e-mail addresses you have collected during your innovation scouting tasks directly from the platform. Find very specific startups for your nice using our boutique scouting service DealMatrix CONNECT. Use one one of our certified partners to scout for startups on your behalf and manage the process using DealMatrix. Import data from other systems using CSV. Add companies manually to your database. If you encounter new or updated information during your work with a startup you can now correct this information directly in the company profile. 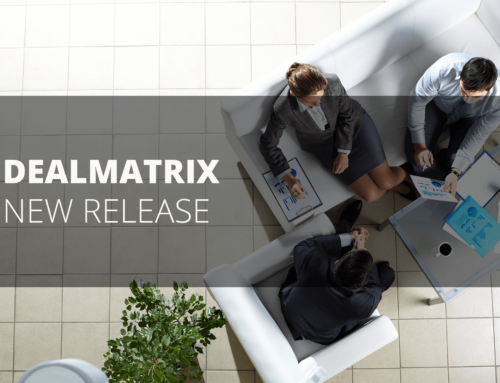 A big advantage using the DealMatrix platform is the unified view of all information you have collected from an applicant. Sometimes you may want to view only the most recent information or a specific submission. In the details view you can now filter by a submission and see only see the corresponding data. Similarly you can also only export a PDF for the currently selected submission. In the settings menu for your tenant you can now specify different email addresses responsible for data privacy, support, administrative and billing issues.